Game description: Castro is dead and a Colombian cartel-backed candidate pursues an all-out revolution. 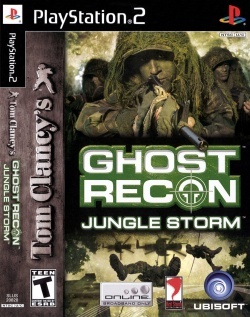 In Tom Clancy's Ghost Recon: Jungle Storm, you lead a group of highly skilled soldiers called Ghosts into Colombia to force the drug-fended mercenaries to retreat. Experience the 16 intense missions in single player or join battles online, going head-to-head with players from around the world. When equipped with the USB headset, you can issue dozens of voice commands to your teammates. It's time to show what you're made of on the battlefield. The game takes place just after the events of Tom Clancy's Ghost Recon: Island Thunder, you lead Ghosts into Colombia to force the drug-fended mercenaries, FARC, to retreat their terrorist attacks against the Colombian Government. Description: The HUD avatar of the protagonist is hidden behind world geometry. Workaround: Go to Config > Video (GS) > Plugin Settings, and set Renderer to "OpenGL (Hardware)". Description: Night vision appears darker than it should be. Workaround: Go to Config > Video (GS) > Plugin Settings, set Renderer to "OpenGL (Hardware)", and make sure Blending Unit Accuracy is set to "Basic"(the default option). Or switch to Software mode by setting Renderer to any "(Software)" options. This page was last edited on 5 March 2017, at 18:34.